CARFAX 1-Owner, LOW MILES - 21,597! Sunroof, Heated Leather Seats, Navigation, Satellite Radio, Turbo Charged, iPod/MP3 Input, Rear Air, WHEELS: 19" X 9" FRONT/19" X 10" REAR... TRANSMISSION: 7-SPEED M-DOUBLE CLUTCH... READ MORE! Leather Seats, Navigation, Rear Air, Satellite Radio, iPod/MP3 Input Rear Spoiler, MP3 Player, Keyless Entry, Child Safety Locks, Steering Wheel Controls. EXECUTIVE PACKAGE Rear View Camera, Head-Up Display, Park Distance Control, Heated Rear Seats, Heated Steering Wheel, Retractable Headlight Washers, TRANSMISSION: 7-SPEED M-DOUBLE CLUTCH Drivelogic, WHEELS: 19" X 9" FRONT/19" X 10" REAR LIGHT ALLOY Double-spoke, style 437M, Tires: 255/35R19 Front & 275/35R19 Rear Mixed performance, MOONROOF. 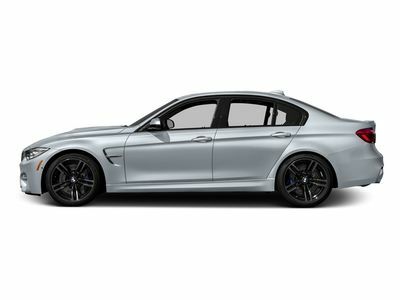 BMW M3 Sedan with Silverstone Metallic exterior and Black interior features a Straight 6 Cylinder Engine with 425 HP at 5500 RPM*. Serviced here, Originally bought here.